It is nice to see Jackie Chan making good movies again, embracing the fact that he is no longer always the leading man. Many action stars get lost as soon as they are past peak, mostly because their egos don’t permit them from stepping out of the spotlight. I would like to see a lot more like Little Big Soldier or Karate Kid and a lot less Spy Next Door. Little Big Soldier earns even more points for me, because Chan is so much more engaging when permitted to speak in his first language. He is a true genius of martial arts, and more importantly, of physical comedy. The combination of these two have always made him a pleasure to watch, assuming the film is not reliant on CGI, which seems to have been Hollywood’s approach to an aging Chan. Little Big Soldier is a simple and somewhat realistic period action comedy, allowing us to see Chan doing what he does best. He may have started with large stunts that earned him injuries for the B-roll during credits, but it was Chan’s ability to combine humor with his martial arts which truly made him stand out. 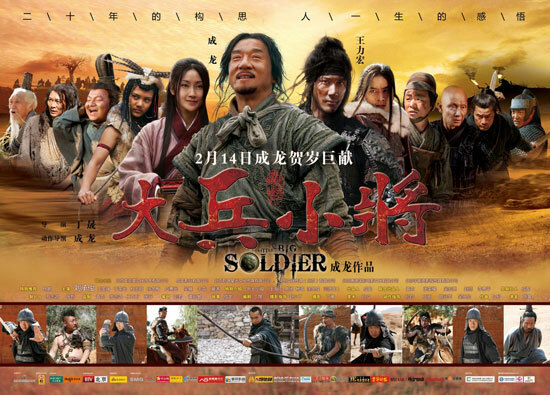 Little Big Soldier also has drama, which takes a forefront over Chan’s comedic performance at times. Chan is a soldier who simply happens upon a wounded general (Wang Leehom) after a battle has decimated both sides. Although the aging soldier simply played dead in order to survive, he takes full advantage of the situation and decides to take the general home for a reward. Along the way they are forced to rely on each other in order to survive several elements, and a deeper plot unfolds before the aging soldier simply wanting the life of a farmer.